6-month-old Samriddho, son of Sourav Dey, fights for his life today due to a severe liver disease called Decompensated Liver Disease. He has a bloated stomach and has already undergone one surgery. 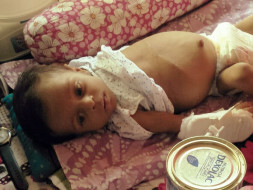 Now he urgently needs a liver transplant in order to treat his condition and help him recover. The total cost of a liver transplant is 16 lakh Rs. Unfortunately, Sourav has exhausted all his funds paying for his son's treatment so far and he is unable to pay such a lumpsum amount for his son's treatment. Sourav is helpless and is willing to do everything he can to save his son. He needs our help and support. Thank you for the love and support you have shown Samridhho. He successfully underwent the transplant and was doing better, however, post-surgery he developed some other liver infection for which he requires immediate treatment. Currently, he is in the ICU and being closely monitored by the doctors. 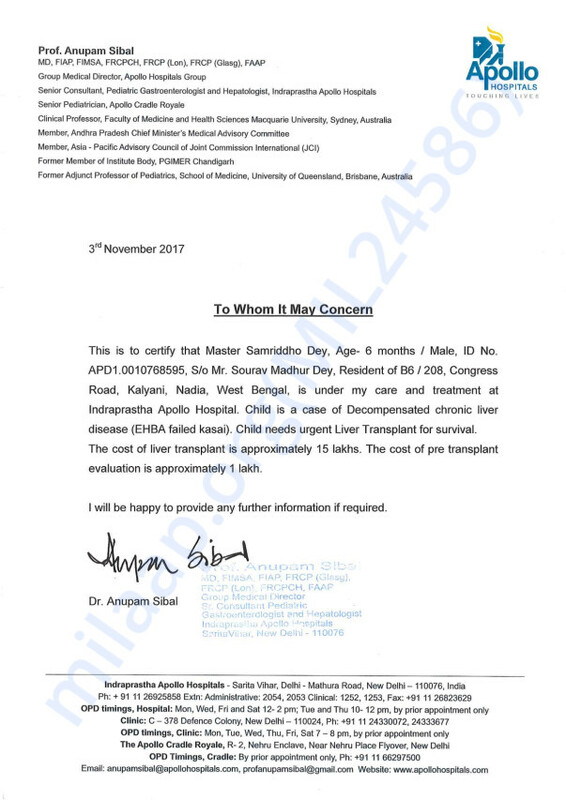 There is a fresh campaign started for Samriddho to support the family as the cost of treatment is 10 lakhs, we request you to share the following campaign link as much as possible to help him undergo the transplant. Here is an update on Samriddho's health. First of all, I would like to extend my utmost gratitude to all the supporters who have made their contribution towards our campaign. Samriddho is currently at home and doing fine. He was moved to Global Hospital, Chennai for the liver transplant. Before that, he had undergone kasai procedure at Apollo Hospital, Delhi and later got transferred to Global Hospital, Chennai. He underwent the liver transplantation surgery on 7th February 2018 at Global Hospital and was successfully done. We will have to visit the hospital for follow-ups for next couple of months. Please pray for Samriddho's speedy recovery. Here is an update on Samriddho. Samriddho is currently in his hometown. He is suffering from intermittent fever and is under medication for the same. We are still searching for a donor for his transplant among his relatives as his parents cannot be the donors. He will meet the doctor in January for the checkup and to explore other options for the transplant. Thank you for your support and love for Samriddho. Please keep him in your prayers.